I am so excited to have been picked as the fresh face winner on the Hero Arts Blog for last weeks "manweek" challenge. I feel so honoured - I always ooohh and aaahh over all the winner's work and so it was a huge surprise to open up the Hero Arts Blog today and see my card front and centre. Thankyou for all the lovely comments on Flickr too. 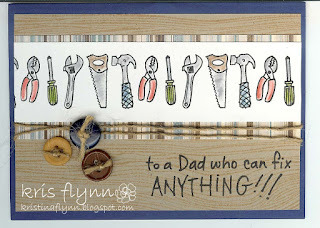 For this card I used HA CL335 - Happy Dad's Day and also the woodgrain background stamp. congratulations on your win! saw your card on the HA blog...you definitely deserve it!